Hotels 4D has a fresh and simple approach to hotel discovery. The focus is finding the right hotel at the location most convenient for you. The magic happens on an interactive map through quick search and live results filtering. Available for Android, iOS, Windows Phone and as a website, Hotels 4D offers a hotel database of over 350,000 hotels worldwide that keeps growing. Our goal is to create a home for all hotels in the world. Top app in its category for Windows Phone! There are seven people involved in the project – Windows Phone, iOS, Android and BlackBerry developers, quality assurance specialist, marketing specialists and project manager. The Windows Phone developer, Lachezara Petkova, is currently working on v.3.0, developing features such as multiple-provider support and a new home screen with enhanced search. The iOS (Galabitsa Chelebieva) and the Android (Dora Dimitrova) developers are working on a tablet version of the application. The BlackBerry developer, Antony Stoyanov, who recently started working on Hotels 4D, is currently running his first sprint developing a BlackBerry 10 version of the application. It is expected by the end of this summer. At present, the designer Ivaylo Filipov is mainly occupied with the Hotels 4D website homepage. He is also creating the design for new functionality, making sure they will have the same feel for users of all three OS and the website. An important task he is involved in is finalizing the updated responsive design version of the application. The marketing team, Petar Schwartz and Milena Samardzhieva, are raising awareness of the product mainly through our social media channels. Currently the team is preparing a travel blog, whose main goal will be to provide helpful information to travelers and attract users to our hotel-finding service. They are also working on the marketing plan for next year, when the emphasis will be on SEO optimization for the website and analyzing user data to increase retention. Vasil Dimov is the project manager. •	Detailed hotel information that includes photos and customer reviews, contacts, facilities and more! Initially launched on Windows Phone, the app has already climbed to the top on this platform, currently being the number one free app in its category, Travel & Navigation – Hotels, in key markets such as Australia, Brazil, Argentina, Spain, Germany. In the rest of the markets, including United States, Canada, United Kingdom and New Zealand, it holds a Top 3 position. A further mark of the app’s strong position is its high user rating. This is why we are confident that Hotels 4D will become similarly successful on the Apple App Store and Google Play. The Hotels 4D platform, encompassing a website and three mobile applications (iOS, Android and Windows Phone), is innovative in its approach to speeding up search in three key areas. These include clustering, a fast performance-optimized search by city, address and hotel name and a new user interface (UI), following the fresh approach. One of the main advantages of Hotels 4D is that it provides the user with all the necessary feedback to quickly find the right hotel directly on the interactive map in seconds. The search results can be instantly viewed on a map in clusters, saving precious display real estate, or in a list sorted by key criteria (price and class). 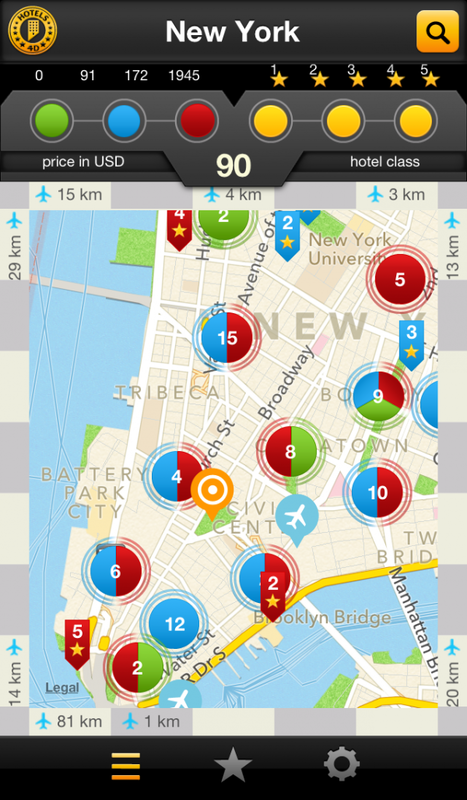 The application uses directional markers through which the user can always see how far and in what direction the city center and nearest airports are from any hotel. Upcoming features will include geo-tagged microblogging, as well as editorial tips and reviews for the most popular travel destinations which will hopefully expand to the entire globe with the help of our partners and users. We are currently developing a version for the iPad and Android tablets. The website and applications do not require registration and are available in Bulgarian, English, French, Italian, Spanish, German, Portuguese and Russian. 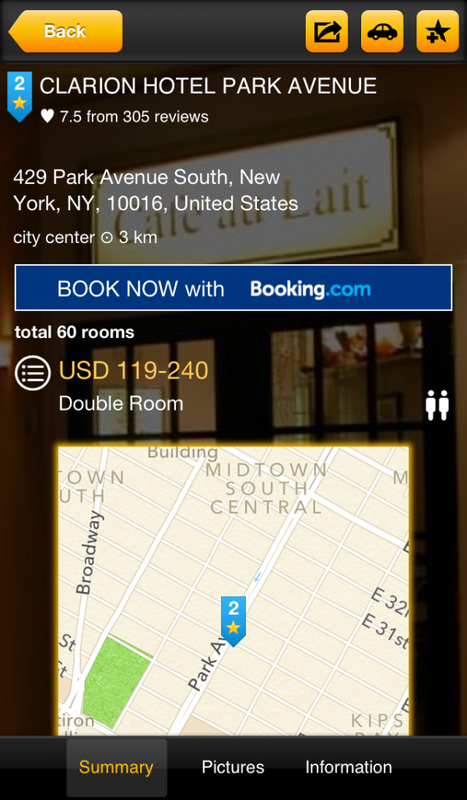 The performance of Hotels 4D is smooth and responsive: price and class filters display real time results in seconds. The interface is designed to be functional and engaging at the same time. All the key information is situated right on the map, making it easy for the user to manage choices without entering second-level pages. The clusters on the map are color-coded and show the number of hotels in a chosen region based on user-selected criteria. There is a ribbon always showing the city center and the airport distance from the chosen location, which aids faster orientation. 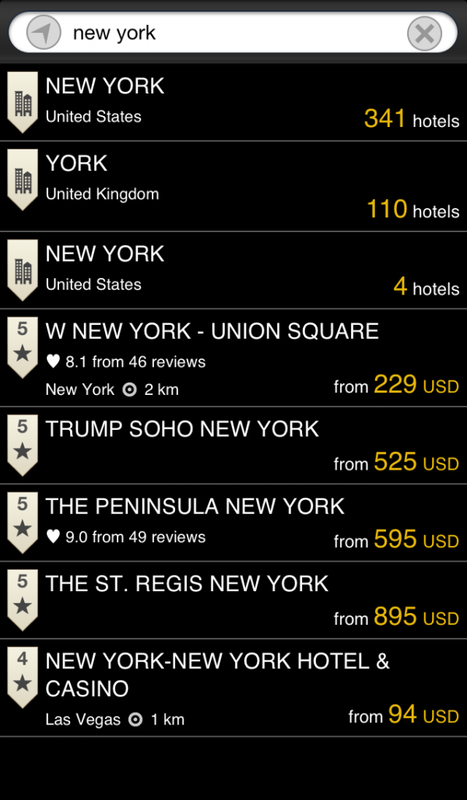 With its multiple providers support, the app offers price comparison: users can see different offers for most hotels from some of the biggest booking providers worldwide and choose the best one. In terms of pure marketing, we will concentrate on search engine optimization (SEO) in the next phase. This will include creating our own optimized content. Later on, we will also incentivize user-generated content through pay-per-engagement campaigns and contests. The SEO effort should help us build a more successful online ad campaign which will be geographically segmented. Having been in the app development industry for a while now, we count on the established relations with relevant media. We are also building relations with travel-related media and associations from around the world. Of course, we have always been proud of our active and open communication with our users through our experienced customer support as well as the social media channels. This has long been a unique advantage of ours in a mobile app industry dominated by smaller studios, start-ups and independent developers. We intend on continuing to build strong customer relationships through our priority channels: directly (customer support), through our websites and blog, and through Facebook, Twitter and YouTube. This category relates to applications dedicate to travel operators & bookings services.